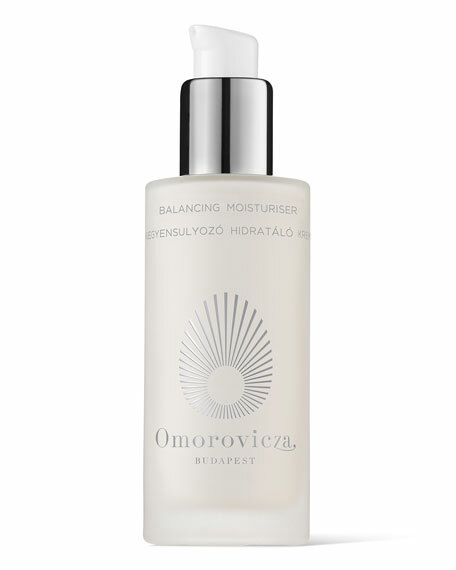 Omorovicza Balancing Moisturizer, 1.67 oz. Cooling and light, this balancing moisturizer absorbs instantly and helps to regulate the production of sebum by the skin; ruby crystal adds radiance to the dullest of complexions. Ruby crystal: Lends the skin instant radiance and helps to blur fine lines and minimize the appearance of imperfections. Pineapple and Rosemary extracts: Help reduce pore size and they also clear skin by removing dead skin cells enzymatically. Apple Pectin: Provides long lasting hydration and restores suppleness. Omorovicza Acid Fix, 1.0 oz. Omorovicza Gold Eye Lift, 0.5 oz.